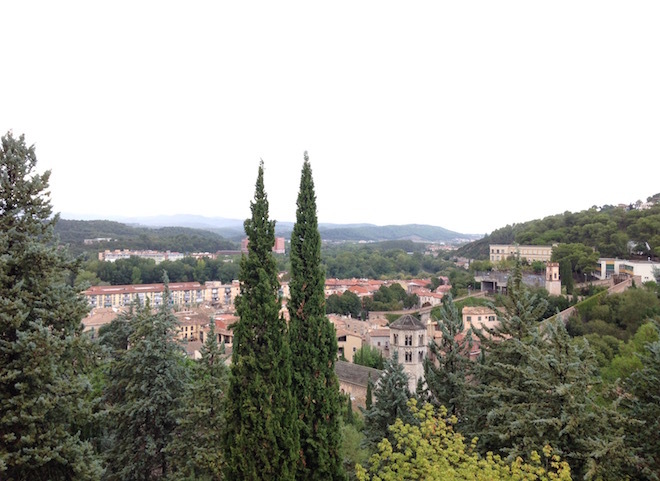 Catalonia is a region in northeastern Spain, sweeping down from the green and rugged Pyrenees to the beautiful lively beaches of Costa Brava, north of Barcelona, and, to the south, the golden sands and clear turquoise waters of the Costa Dorada. 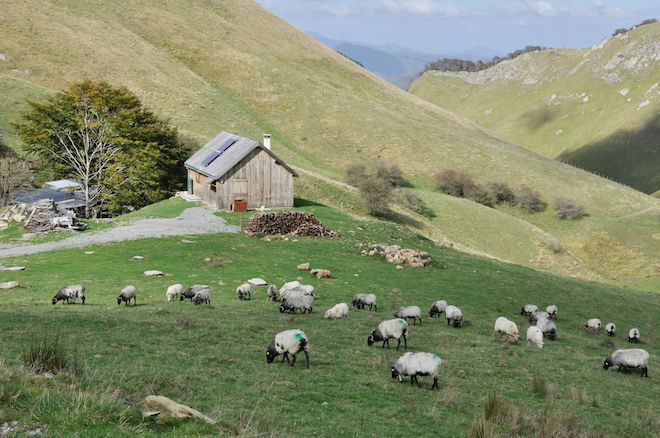 The land is a mixture of mountains and plains, which makes the climate and agriculture very varied, as expressed through its cuisine. The cuisine of Catalonia, called Catalan cuisine is Spain's oldest on record, reflecting the region's historical past, culture, self-identity and the independent spirit of its people. 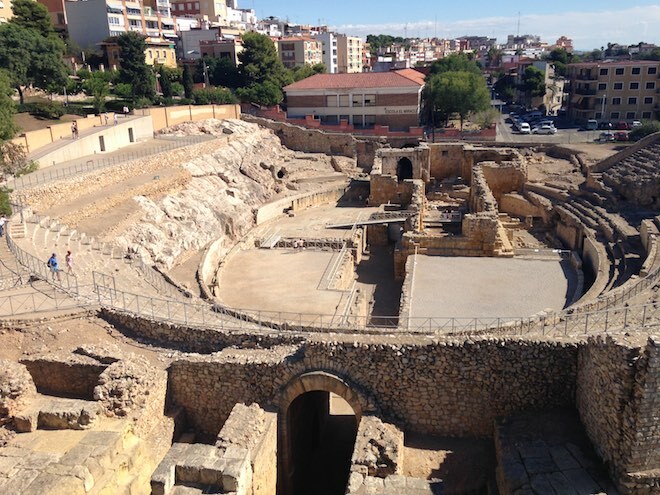 The Greeks founded the city of Ampurias, on the Mediterranean, north of Barcelona. Today that district, L'Empordà with its close proximity to Costa Brava, is one of Catalonia's main gastronomic centers. 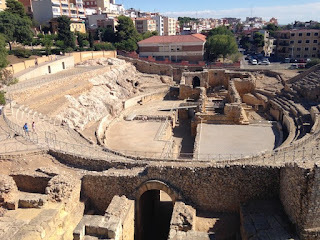 The Romans later established in Tarragona, south of Barcelona, the capital of their Spanish empire, Hispania. Both Greeks and Romans had great influence in the cuisine of Catalonia, and in all of Spain. The cazuela, a clay cooking pot, known to be one of the oldest cooking vessel that is still in use today in many Catalan and Spanish kitchens has its origins in the Greek period. There is also Arab and Jewish influence on Catalan cuisine. Documentation proves that rice cultivation in Pals a medieval town in Catalonia began in the fifteenth century, believed to have been introduced by the Arabs of Valencia, though Arabs are known to have introduced rice in the 9th century into the Iberian peninsula. The Arabs are also known to have introduced artichokes, sugar cane, eggplants and cinnamon. The Jews are also known to have a big influence on the Catalan cuisine and the best representation of the Jewish life in Catalonia is in Girona, a small town north of Barcelona. Cooking techniques such as pickling things were common practices in the Jewish culture. 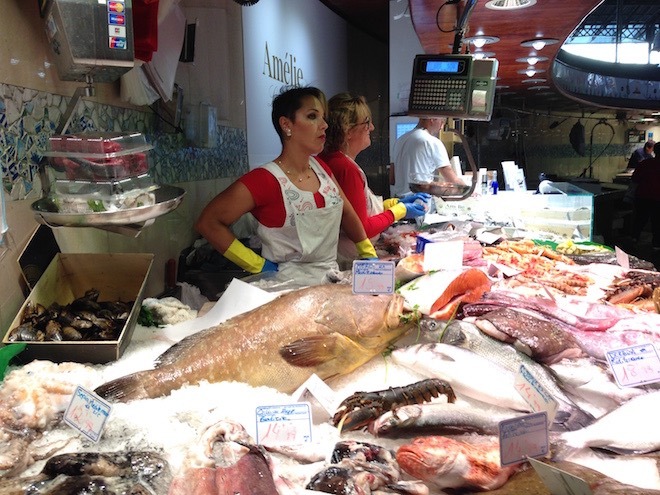 Catalan cuisine is Spain's oldest on record. The first Spanish cookbook is the 'Libre de Sent Sovi', written in the Catalan language in the first half of the fourteenth century. The cuisine of L'Empordà which is one of Catalonia's main gastronomic centers is a reflection of the territory: the sea provides an excellent variety of seafood while meat, cheese, mushrooms and wild fruits come from the nearby Pyreness mountains and top quality rice from Pals called 'Arroz de Pals' is a major element in many dishes. There are two well defined cuisines in Catalonia: the ﬁsherman/style dishes of the coast, based on the bounty of seafood; and the diverse meat and vegetable based dishes of the inland areas. The influence of this different styles gives Catalan cuisine a variety of flavors and contrasts often referred to as 'sea and mountain' cooking. 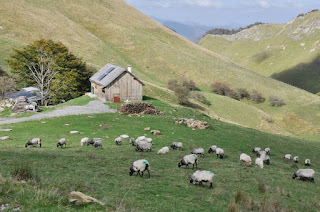 The Pyrenees also provide the right environment for some of Catalonia’s best cheeses, such as Serrat, dry or semi-dry with a classic, intense taste of the sheep’s milk from which it is made; and de Aràn a slightly smoked, cow’s milk cheese. Another excellent cow’s milk cheese is La Selva, made near Girona; it can be fresh (white) or tender (pale yellow), both soft creamy and delicate. Catalan main dishes rely on five basic sauces: sofrito, samfaina, picada, allioli and romesco. Sofrito consists of onion and tomato slowly sautéed in olive oil, sometimes with garlic, peppers or other ingredients. It is used as a basis for many dishes and sauces. Samfaina is a mixture of tomato, onion, sweet pepper and eggplant sautéed in olive oil. It is used as a sauce or base for meat, fowl and fish fishes. Picada, which literally means pounded, is usually a mixture of garlic, parsley, nuts, some toasted or fried bread and sometimes saffron or other spices. Picada is used as a thickening and ﬂavouring agent. Allioli is made with pounded garlic and olive oil mixed in a mortar until it turns to a creamy paste, which is ideal for meat and fish. Romesco is a nut and red-pepper based sauce that originated from Tarragona. It is a favorite accompaniment to grilled fish and vegetables. The main ingredients in Catalan cooking are: olive oil, garlic, tomatoes, onions, nuts (almonds, hazelnuts and pine nuts) and dried fruits, particularly raisins and prunes. The traditional herbs are bay leaves, oregano, rosemary and thyme. 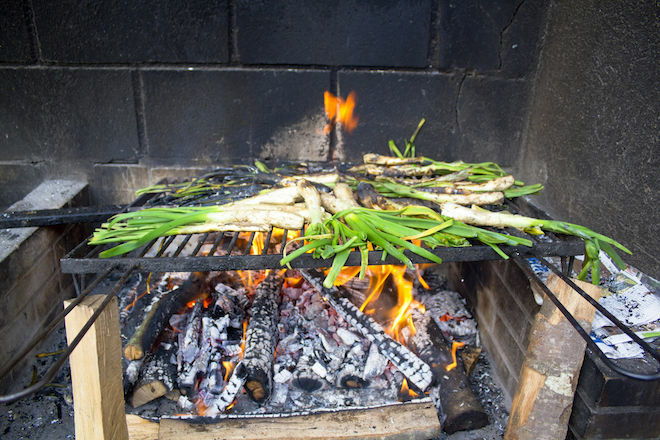 Catalans love grilled dishes, especially cooked outdoors on an open fire. Parrillada, a combination of grilled shellfish, seafood or meat, is a great favorite. 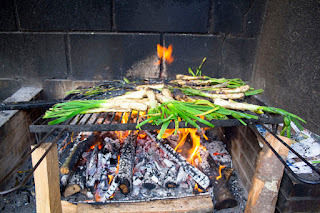 They also like to barbecue vegetables such as calçots which are spring onions or make assorted grilled vegetables called Escalivada. 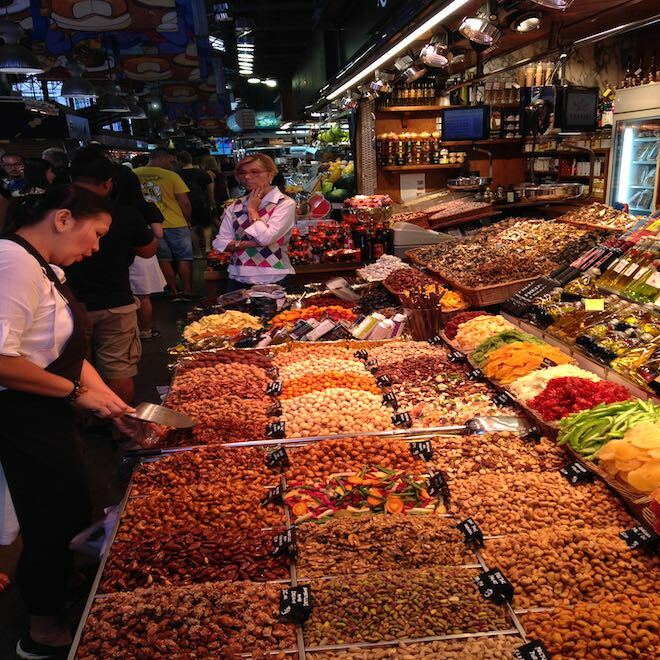 Catalans also like to cook with fruit as in chicken with prunes, goose with pears, duck with figs or spinach with pine nuts and raisins. 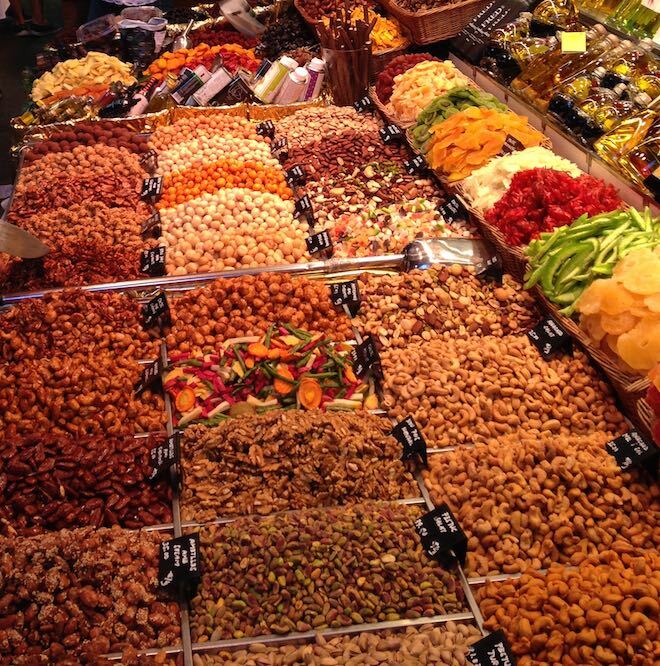 Generally any dish prepared a la catalana is likely to contain pine nuts and raisins or prunes. Pa amb tomàquet which means 'Bread with tomato' is a simple and typical recipe in Catalan cuisine. 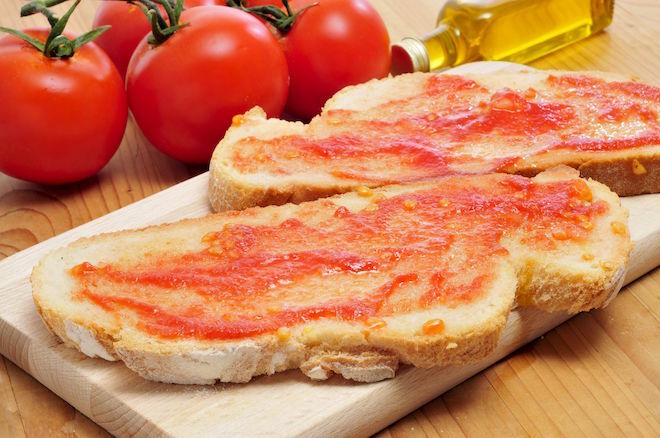 Pa amb tomàquet consists of bread, which may or may not be toasted, with tomato rubbed over and seasoned with olive oil and salt. Sometimes, garlic is rubbed on the bread before rubbing in the tomato. Escudella i carn d'olla is a typical Catalan winter dish. It is based on the same principle of cooking meat and vegetables together. There are two separate versions of the dish, a soup and a stew. The stew in its classic form, includes bacon, ham bone, marrow bone, pig's ears and feet, veal, chicken, salami, white sausages called butifarra, ground veal, all cooked together in a broth with beans, potatoes, cabbage, parsley, thyme, saffron, garlic and pasta. After cooking, usually all day, it is eaten in two stages; the rich broth with the pasta is eaten as a ﬁrst course, followed by plates of the varied meats and vegetables. 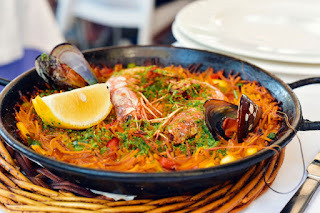 Fideuà is a traditional dish similar to paella but made with short lengths of dry pasta called fideus. Instead of boiling the noodles Italian-style, the Catalan way is to cook them with only a small amount of liquid in a wide earthenware cazuela or paella pan. Here, the noodles are ﬁrst browned in olive oil, then simmered in a rich ﬁsh and shellfish broth, with different seafood added to it. Anchovies are another Catalan delicacy. The most well-known Catalan town for anchovy production is the L’Escala, located on the Costa Brava. They even have an annual dedicated festival for the anchovy, Festa de l’Anxova, every year in October. 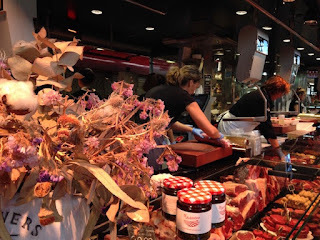 Mercat de Sant Josep better known as 'La Boqueria', is Barcelona's most famous and picturesque market. It is on the La Rambla Avenue and has many stalls with cheese, fruit, herbs and vegetables, wild mushrooms, fish, meat and variety of different spices. Many local chefs refer to it as a 'gastronomic temple' and it is a great reflection of the diversity of the Catalan cuisine.